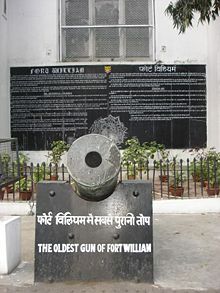 The Black Hole of Calcutta incident refers to forty three British soldiers and their Indian comrades in arms who perished in the Fort William brig, June 20, 1756. The events leading up to the Black Hole of Calcutta involved a campaign by the Nawab of Bengal, Siraj ud-Daulah against the British East India Company security forces in Calcutta. In June 1756, he marched on the Company's settlement with a sizable force of 30,000 foot soldiers, 20,000 horsemen, 400 trained elephants and eighty pieces of cannon. Faced with overwhelming superiority, most of the British soldiers fled along with their Indian troops. Siraj-ud-Daula took captive the few who remained, putting them into the brig at Fort William for the night. The brig had been called the Black Hole by the British, and the name stuck after the events of the night had passed. June 20, 1756, proved a sweltering night, forty three of the sixty four prisoners perishing from heat exhaustion and suffocation. Robert Clive, the man who proved most important in establishing of the British East India Company as a colonial power in India, led a putative expedition, defeating Siraj-ud-Daula and the Marathas. Clive continued over the next eleven years, until 1766, when he left India, to set up the British East India company in firm control of much of India. The Black Hole of Calcutta had given him the entrée to set Great Britain on the path to ruling India until 1947. The British built Fort William to protect British East India Company trade in the city of Calcutta, Bengal. The British, preparing for battle with the French during the Seven Years War (1756-1763), fortified Calcutta, especially by strengthening Fort William. The Nawab of Bengal, Siraj ud-Daulah, rightly felt concern that the fortification marked the British East India Company's encroachment upon Indian sovereignty. He ordered both French and British to immediately stop building the fortifications. The French at Chandernagore complied. The British ignored the command, fearing the war with France would catch them unprepared. Siraj gathered his large army, including artillery and Europeans hired to train the Indians, and marched on Calcutta. Siraj advanced unopposed, finding the approach to Calcutta unfortified. As the Indian force advanced, the British fell into confusion. The garrison's commander organized an escape, and left a token force in the fort under the command of John Zephaniah Holwell, a one-time military surgeon and top East India Company civil servant. Desertions by allied troops, mainly Dutch, made even that temporary defense untenable. Their evacuation of the fort by ship fell into disorganization. Siraj laid siege to the fort. The British, including many civilians, fought bravely for three days before the fort fell to the Nawab of Bengal. Accounts relate that Indian soldiers took the surviving defenders prisoner. That included British soldiers, Anglo-Indian soldiers, and civilians who had been sheltered in the Fort. Some prisoners escaped, while others attacked their guards. In the end, the Indian soldiers placed sixty four prisoners into tiny room eighteen feet (5.5 meters) long and 14 feet 10 inches (4.3 meters) wide. The room had two small windows. According to Holwell, the troops, apparently acting without orders, had packed the prisoners in the small guard room, locking them in overnight. Prisoners begged for water or release, growing delirious from heat exhaustion. As time passed, prisoners collapsed from heat stroke, suffocation, or trampling. Siraj Ud Daulah released the prisoners in the morning, becoming aware of their plight after he woke. In one account of the incident, the Siraj's soldiers imprisoned 146 prisoners, 123 of them suffocating during the night. That version of events, supported by other survivors, received wide accepted at the time in Britain. Even as late as 1957, Winston Churchill cited those numbers. The reason for confusion may lay in the chaos of the falling of the fort. Because so many non-combatants took refuge in the Fort, the number that died cannot be stated with any precision. The Siraj's soldiers threw the corpses into a ditch. They sent Holwell and three others as prisoners to Murshidabad; the rest of the survivors obtained their liberty after the victory of a relief expedition under Robert Clive. The British later used the Black Hole as a warehouse. They erected an obelisk, 50 feet (15 meters) high, in memory of the dead. Holwell portrayed the night as follows: The dungeon, a strongly barred room had been intended for the confinement of two or three men at a time. The room had only two windows. A veranda projecting outside and thick iron bars within impeded the ventilation. Fires raging in different parts of the fort suggested a further oppressive atmosphere. The prisoners packed so tightly that closing the door became difficult. The prisoners offered one of the soldiers stationed in the veranda 1,000 rupees to have them removed to a larger room. He went away, but returned without accepting the money. Doubling the bribe, the soldier tried again without success; the nawab slept, and no one dared wake him. By 9 p.m., several had died and many more became delirious. A frantic cry for water became general. One of the guards brought some to the bars. In their impatience to receive it, the water nearly all spilled. The little they drank seemed only to increase their thirst. Loosing self-control, those in remote parts of the room struggled to reach the window. A fearful tumult ensued with many trampled to death. They raved, fought, prayed, blasphemed, and many then fell exhausted on the floor, dying of suffocation. By 11 p.m., prisoners began to die rapidly. At 6 a.m., Siraj-ud-Dowla awoke, ordering the door opened. Howell counted only twenty three of the original 146 still living. Fresh air soon revived the survivors. Soldiers took the commander before the nawab. Howell reported that he expressed no regret for the calamity. Holwell and some others acquitted him of any intention of causing the catastrophe. They attributed the crime to officers who acted without orders. Holwell's account included a summary of the alleged victims: Dutch and English sergeants, corporals, soldiers, topazes (Indian soldiers fighting for the British), militia, whites, and Portuguese, making on the whole one hundred and twenty-three persons. Of Council—E. Eyre, Wm. Baillie,. Esqrs., the Rev. Jervas Bellamy. Gentlemen in the Service—Messrs. Jenks, Revely, Law, Coales, Valicourt, Jeb, Torriano, E. Page, S. Page, Grub, Street, Harod, P. Johnstone, Ballard, N. Drake, Carse, Knapton, Gosling, Bing, Dod, Dalrymple. Lieutenants—Bishop, Ifays, Blagg, Simson, Bellamy. Ensigns—Paccard, Scot, Hastings, C. Wedderburn, Dumbleton. Sergeants—Sergeant-Major Abraham, Quartermaster Cartwright, Sergeant Bleau (these were sergeants of militia). Sea Captains—Hunt, Osburne, Purnell (survived the night, but died next day), Messrs. Carey, Stephenson, Guy, Porter, W. Parker, Caulker, Bendall, Atkinson, Leech, and so on. Holwell claims that 123 died of 146 held. While his account met with ready belief in Britain at the time, other contemporary accounts claimed a larger number and differed on other details such as the room size and the presence of windows. In 1915, British scholar J.H. Little challenged Holwell's claims in his article, "The Black Hole—The Question of Holwell's Veracity," arguing Holwell an unreliable witness of questionable veracity. Little went so far as to label Holwell's version "a gigantic hoax." Other historians, including Indian scholar Brijen Gupta, disagreed with Little's allegation, but nevertheless consider Holwell's account exaggerated. Since only forty-three of the Fort William garrison had been listed missing after the calamity, the minimum number of deaths would be forty-three. The difficulty in ascertaining the number is increased by a number of factors. First, not all the prisoners had been listed as members of the garrison. Second, the Indians made no list of British and Dutch soldiers surrendering at the fort, not even a count of heads. Third, many escaped between the surrender and the confinement in the "Black Hole." Even a friend offered Holwell a chance to escape. Although the number of deaths in the "Black Hole" has generally been accepted as forty six, the actual number of deaths will probably never be definitively established. 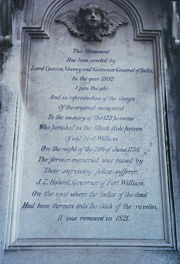 Holwell erected a tablet on the site of the Black Hole to commemorate the victims. It had been stolen at some point before 1822 (the precise date remains unknown). Lord Curzon, the new Viceroy in 1899, noticing that nothing marked the spot, commissioned a new monument. He mentioned Holwell's tablet on the spot previously. In 1901, Curzon placed the obelisk at the corner of Dalhousie Square, the reputed site of the Black Hole. At the apex of the Indian independence movement, the presence of that monument in Calcutta became a nationalist issue. Nationalist leaders like Subhash Chandra Bose lobbied energetically for its removal. The Congress and the Muslim League joined forces in the anti-monument movement. As a result, the government removed the obelisk from Dalhousie Square in July, 1940, and placed it in the graveyard of St John's Church, where it remains to this day. The Black Hole itself has long been taken down and no traces of it remain today. ↑ Geoffrey Moorhouse, India Britannica: A vivid introduction to the History of British India (New York: Academy Chicago Publishers, 1983), 37. ↑ Geoffrey Moorhouse, India Britannica: A Vivid Introduction to the History of British India (New York: Academy Chicago Publishers, 1983), 38. ↑ Winston S. Churchill, A History of the English-Speaking Peoples (London: Cassell, 1957), 220. ↑ Encycolpaedia Britannica, Black Hole of Calcutta. ↑ Winston S. Churchill, History of the English Speaking Peoples, 221. ↑ H.E. Busteed, Echoes From old Calcutta, Being Chiefly Reminiscences of the Days of Warren Hastings, Francis and Impey (London: W. Thacker, 1908), 30-56. ↑ Mesrovb Jacob Seth and Mesrovb Jacob Seth, Armenians in India: From the Earliest Times to the Present Day: Work of Original Research (New Delhi: Asian Educational Services, 1992), 470. ↑ Brijen Gupta, "The Black Hole Incident," The Journal of Asian Studies Association for Asian Studies, Far Eastern Association, JSTOR (Organization). ↑ Busteed, Old Calcutta, 52-56. Ahmad, Saiyid Amin. 1935. The Black Hole of Calcutta. Patna: United Press. OCLC 334063. Barber, Noel. 1966. The Black Hole of Calcutta; a Reconstruction. Boston: Houghton Mifflin. OCLC 1361481. Churchill, Winston S. 1957. A History of the English-Speaking Peoples. London: Cassell. OCLC 186160163. Busteed, H. E. 1908. Echoes From old Calcutta, Being Chiefly Reminiscences of the Days of Warren Hastings, Francis and Impey. London: W. Thacker. OCLC 6072125. Gupta, Brijen Kishore. 1959. The Black Hole Incident. New York: [s.n.]. OCLC 227830609. Hill, Samuel Charles. 1902. List of Europeans and Others in the English Factories of Bengal at the Time of the Siege of Calcutta in the Year 1756: With an Appendix Containing Lists of European Sufferers. Calcutta: Office of the Supt. of Govt. Print. OCLC 20394343. Holwell, J. Z. 1758. A Genuine Narrative of the Deplorable Deaths of the English Gentlemen, and Others, Who Were Suffocated in the Black-Hole in Fort-William, at Calcutta, in the Kingdom of Bengal, in the Night succeeding the 20th day of June, 1756, in a Letter to a Friend. London: A. Millar. OCLC 2894470. Macfarlane, Iris. 1975. The Black Hole: or, The Makings of a Legend. London: Allen & Unwin. ISBN 9780049540194. Seth, Mesrovb Jacob, and Mesrovb Jacob Seth. 1992. Armenians in India: From the Earliest Times to the Present Day: Work of Original Research. New Delhi: Asian Educational Services. ISBN 9788120608122. The Straight Dope: Is the black hole of Calcutta a myth?. History of "Black Hole of Calcutta"
This page was last modified on 11 June 2016, at 15:55.